God is rocking our family! In the midst of our own fair share of tough “stuff” and struggle life can throw at you, there is also an ever increasing intimacy with God we can be experiencing in beautiful ways unique to each one of us. The challenges are REAL for sure but God’s Presence is eclipsing the fear and hopelessness that used to be part of our struggle. It’s looks different for Trevor than it does for Connor and it looks different for Christine than it does for me. But fruit of God's Presence is cumulatively coming together and transforming our family. Day by day, as we individually, incrementally, believemore and more, that we ARE who God says we are, we begin to actually live as sons & daughters of God. Christine - I’d say the biggest shift that’s happened with Christine is that she has completely transitioned from “helping me” with ministry life to “PARTNERING with me” in our life expressed as ministry. HUGE SHIFT! The people we are walking with, loving, encouraging, NOW get the wonderful benefit of Christine’s heart in everything we do as Third Chair. Now THAT’S an UPGRADE! She is not working at Sprouts anymore, but does some PT work with an events company as a server. She meets with people, as I do, pouring her heart into theirs, listening so well and able to encourage with a fit word that always seems to drop out of heaven for whoever she is meeting with. More and more beautiful everyday inside and out. Such a wonderful mother and wife. I think she’s just getting started. You should hear what she dreams of. Trevor - Trevor is in his second year of BSSM (Bethel School of Supernatural Ministry) up in Redding California. If you remember, his first year was a couple years ago. He launched out on a ministry adventure after his first year to Nepal. His plan: what does love look like everyday I’m here in country. Many, many amazing stories and miracles. After his return from Nepal and traveling abroad, he entered into a pretty difficult dark season (to be blunt), that lasted close to 2 years. Trevor left for Redding last September 2018 and we really saw or heard little from our son while he and the Lord were working things out in his heart and mind in Redding at BSSM. If you know Trevor, he doesn’t do anything half way. He’s an “all-in” kind of creative soul so this sentence “working things out” fails miserably to describe the pain, isolation, struggle and entanglement my son found himself in. Connor & Trevor celebrating Connor’s 21st Birthday at the Porsche Experience Track. Three weeks ago, when this photo was taken, was the first time we saw our son since he left for Redding. He came home for his brother, Connor’s, 21st birthday. Over the condensed 72 hours we had with Trevor over this birthday weekend, we discovered he had undergone some radical encounters weeks earlier with the Holy Spirit which displaced the darkness that clouded his heart & mind. He came into this weekend full and overflowing the love of God. And it overflowed into his brother’s heart, into his mother’s heart and into his father’s heart. He finishes up his semester in May 2019. He’s still working out the details of staying in Redding for another year. We are full of joy. Trevor is currently in Scotland with BSSM this month on a mission trip and is completely “STOKED”. Connor - Connor is finishing up another semester at Mira Costa College getting his general ed out of the way and working a ton. He has so many options in life at 21 that it can be somewhat paralyzing but he continues to press on to discover his next steps. He has recently rediscovered his freakishly remarkable talent for photography and is investing into that as well. Connor carries a tremendous sensitivity to the Holy Spirit and to people (which is difficult to manage for a young man). I see a man who is growing into a maturity that can steward these “superpowers” in ways that elevate those around him while not completely overwhelming his heart with all the information he gets downloaded. He’s like a newly made fine instrument that will only become more refined, nuanced and valuable with time as it’s used. Roy - You hear too much about me as I have yet to master the art of short concise communication. What I will share with you is that we plan to take a family trip to Europe this summer! We were gifted tickets to the UK for the 2019 David’s Tent in England and we decided to build a trip that would include Trevor & Connor. We plan to see Christine ‘s relatives in Sweden all together, celebrate our 25th wedding anniversary somewhere in Europe while Trevor and Connor go off on their own adventure together. Then we will all rendezvous at David’s Tent in England than return together all this August. We can’t believe we are doing this! Mentoring is a relationship in which one person facilitates another to reach his or her God-given potential, through the sharing of God-given resources. One on One mentoring: Mentoring is a relationship in which one person facilitates another to reach his or her God-given potential, through the sharing of God-given resources. I do this every week and I’m incredibly honored with those who want me to spend time with them. This is NOT hanging out. It might feel like that at times. It’s NOT a “mentoring program” I take people through. It’s what I believe Jesus modeled and invited each of us to do - make disciples. I’m NOT making my disciples. What I see Jesus doing in scripture is receiving daily from the Father, sharing what He receives into the hearts of those He is walking with - He basically is giving them His life, His resources, His connections, His authority, His relationship access to the Father, His time. If He taught a kingdom principal - He then demonstrated it. If He demonstrated a kingdom value - He then taught them about what He just did. This intentional pour into someone’s life is something that is sadly missing in some of our information, event driven culture of doing church. It is something Jesus invited us ALL to do - go and make disciples. (which I believe is more than simply talking about God and what He says and means in scripture). It always involves Love. It always involves relationship. It always involves transformative encounters with the Father. It’s something that shouldn’t be delegated to someone else who has the “discipleship gift”. A table is being set for a Southern California Community of Artists coming together around a beautifully prepared meal; creative inspiration; spiritual identity; and a powerful love for God, one another, and our neighbor. Artist Guild: A table is being set for a Southern California Community of Artists coming together around a beautifully prepared meal; creative inspiration; spiritual identity; and a powerful love for God, one another, and our neighbor. We host these amazing gatherings every 60 days. We don’t advertise. We are building this community through invitation and relationship. If you’ve been to an Artist Guild it’s because a creative who has attended invited you. We have seen hundreds of people through our short time we’ve been gathering. And now a younger generation has been joining the “experienced artist” crowd. We are intentionally setting the table for mentoring relationships to be birthed at Artist Guild. If you are creative and would like to come to our next Artist Guild in May, I invite you to contact me and we will add you to the guest list. At Artist Guild, we set a table. Invite creative people over. Holy Spirit breathes life into the table conversations, the creative story-telling, the invitation for deeper relationship with God and other artists. It’s powerful. It’s beautiful. It’s simple. It’s Supernatural. It’s Love. It’s bigger than us because it’s His. We were simply invited to join Him. Here are some photos from our last Artist Guild looking at the Art of Collaboration. Norm Stockton and Dave Owens shared some thoughts and music from Norm’s latest offering “Grooves and Sushi” We so value relational connection with creatives from all over So Cal, enjoying an artfully prepared meal and intentionally pouring into their spiritual lives..
A Three Day Creative Retreat is in the works. There is something so powerfully transformative that happens when we retreat from our normal rhythms of life and get away with others from our creative tribe and with the Lord. 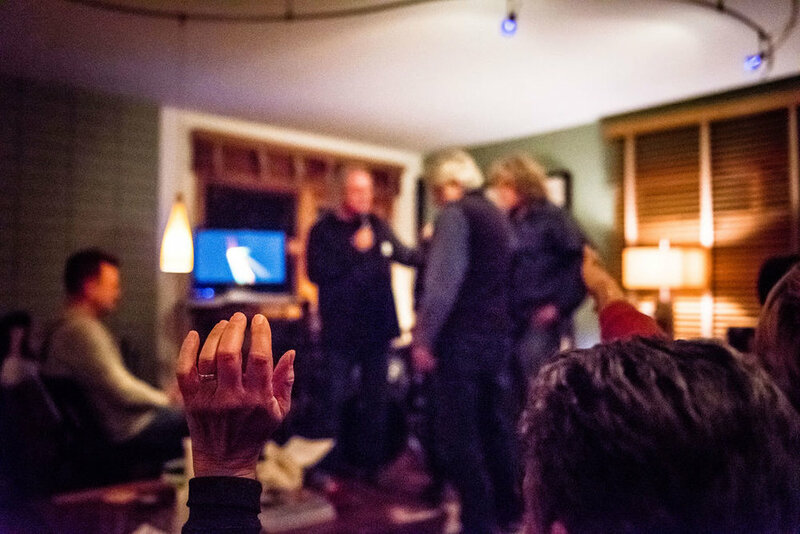 Our Third Chair Curation Team have been involved with many impactful Creative Retreats from my time with The Worship Mentor Network and The Grove Center for the Arts & Media, as well as the organizations and churches they have served with. We have begun with prayer and we are moving to look at some dates that might work in the near future. More information to come as we get downloads from God. We have a uniquely diverse community of creative people. Many are seasoned veterans, a few are rising stars and many are somewhere in between. We are in the planning stages of hosting One Day Retreats for Songwriting, Live Painting, Photography, and Cooking. We are also working on workshops for the Rhythm Section, for Guitar and for Vocals. Look for these Artist Guild Day retreats to be made available beginning the Summer 2019. Contact roy@roycochran.com if you’d like information about one of these Day Retreats or if you would like to offer your experience to help us offer another creative expression to grow in. David’s Tent is a 72 hour non-stop worship event where people gather from all around the world, across different denominations and church expressions to worship Jesus. What began in the U.K. is now spreading to the U.S. There have been so many confirmations that have revealed that God is breathing on this and His heart is beating for the Southern California region. We are beyond excited to see this all unfold in San Diego at the Del Mar Fairgrounds and for us to experience the presence of God together as we influence a region and gather the nations. A life changing 3 days of worship where the ONLY agenda is giving building an alter for thousands of people to come give God praise, adoration, worship . . . really! I was first invited to be part of David’s Tent (DT) in England in 2014. I returned again in 2016 to experience something I never experienced before; 6000 people completely “ALL-IN”, in expressing worth and honor and praise to God for 72 hours in the English countryside. This was NOT like a huge music festival. This was freaking Holy Ground and I am not one to be hyper-spiritual. I was completely undone in His Presence. The hunger for expressing praise and honor in this crowd was nothing I’ve ever experienced. They were there for God, not the worship leaders on the stage. And when one of those worship leaders wasn’t leading from the stage, they were either cheering on the other leaders or they themselves were on their faces in worship. David’s Tent is an invitation not an event. The historical David’s Tent was set aside solely for God’s manifest Presence. Today you and I have become “David’s Tent”, the mobile tabernacle set aside for God’s manifest Presence. At David’s Tent, this wonderful truth about you and I became real in a fresh powerful way to my heart. Fast forward to 2019. David’s Tent is coming to the USA! In fact, it will be held at the Del Mar Fairgrounds October 10-13 this year! Christine & I have been invited to be Ambassadors for David’s Tent and we couldn’t be more honored. We want to connect as many of you to DT as possible. There are so many opportunities to become involved from leading worship to serving as one of 250 Kingdom Builders who join us in hosting our first David’s Tent in the USA this year. It’s not coincidental that DT is landing in Southern California. Our region has been undergoing radical and lovely transformation in recent history and many of us have been walking in the wonder and reformation God is doing everywhere we turn. I believe David’s Tent is becoming a beautiful harmony and catalyst to all God is already stirring up in So Cal. Tiffany & Justin Buhler, the executive directors of David’s Tent UK and US have moved to our region here in Carlsbad. They are planting roots down with us here in Southern California. It’s an honor to walk with them and invest with them. If you want to join in with us at David’s Tent, there’s a place for you as well as your church community! I’ll include some links or you can just give me a call and we’ll get you connected. I believe in the next few years, when we look back at this first season, we will see that God Divinely called the perfect team of people together to host His Presence. Since 2012 we have hosted an annual 72 hour non-stop worship event where thousands have come away to worship together. We have been stunned by the tangible sense of unity, explosive passion and vibrant community that has emerged over the years both at the summer festivals and regional worship nights. more about DT. . .
David’s Tent Worship Leaders 2019 - Steffany Gretzinger, Jason Upton, Jonathan Helser, Jaye Thomas, Jeremy Riddle, Lindy Conant, Sean Feucht, Cageless Birds, Olivia Buckles, more about Worship Leaders. . . Regional DT Worship Nights - Join us thoughout the year as we gather in unity with people from across all different denominations and church expressions to lift up Jesus at our regional events. We’ve already had 2 DT Worship Nights this year with Jeremy Riddle and Jason Upton. 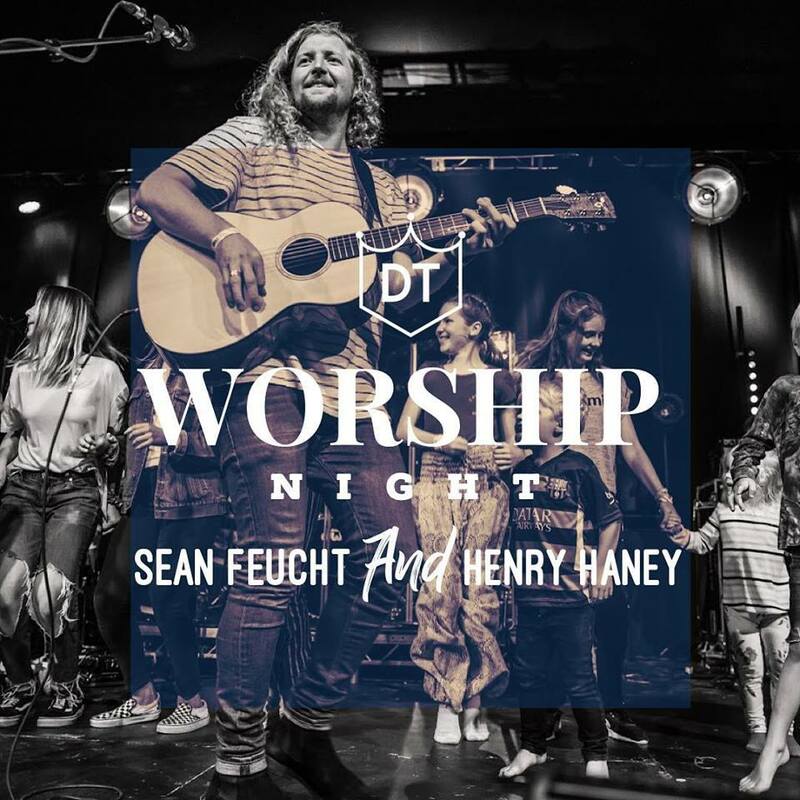 Our next DT worship Night is happening in April. This will be a free event, but registration is required. An offering will be taken during the evening.